Early in its history, the White Eagle was known as the B. Soboleski & Company Saloon. The original saloon was established in 1905 in an earlier 1880s wood framed structure at this location. The present simple brick two-story structure was completed in 1914, replacing the old commercial building. Barney Soboleski and William Hryszko, who were Polish immigrants, established the new business. As Portland was experiencing an unprecedented boom, business was very good for these enterprising individuals, who probably started with very little working capital. Barney Soboleski lived in the building while his partner William Hryszko resided in Walla Walla, Washington. Brother Joseph Hryszko worked in the saloon as a bartender and lived in one of the rooms upstairs. The saloon was one of 11 that operated on lower Russell Street after the turn of the 20th Century. During the early days of operation, this establishment offered free lunches to entice more customers, a practice done by many saloons and taverns around Portland. This helped many unemployed and transient males from going hungry, many of who were recent immigrants. The Portland City Council banned this in 1913. Most of the regulars though were Albina workers from the railroad, foundries, and dry-dock. The place filled up, especially between shifts, becoming a social gathering place for the area’s Poles, Russians, Germans, and Slaves creating a scene of ethnic mixing and mingling. It was also a watering hole for a large variety of sailors who came from docked ships on the waterfront. By the 1910s due to strong competition, the saloon was rumored to have turned to illegal activities such as gambling and prostitution. In 1914, Barney Soboleski sold out his portion of the business and both the Hryszko brothers now were owners and the name was changed to Hryszko Brothers Saloon. This was also the time a new brick-framed building replaced the old one. The upstairs was enlarged and the rear was extended to the back of the property. Stories fly that the new building was designed to house expanded gambling activities in the back and brothels upstairs and in the basement. In 1917, the name was changed to the Hryszko Brothers Soft Drinks Emporium in response to an Oregon Prohibition law passed. As some old-timers later recalled, it was only a name change as vice activities reportedly continued inside the establishment. A bank vault door to the basement was believed to be used to hide booze during prohibition. Some also speculate that shanghaiing took place here as tales go that the basement was once connected to an underground tunnel network leading to the waterfront. This practice was the act of an unsuspecting patron passing out in a back room from “spiked” drinks, being liberated of his money, and in extreme cases, waking up aboard a ship headed out to sea. No strong evidence backs this tale here but that activity did occur near the docks in NW Portland. Things seemed to have settled down after Prohibition ended. In 1938, the name was changed to the Hryszko Brothers Restaurant & Beer Parlor as a function of a normal modern bar took place. After several more years, Robert Hryszko, the son of William took over the management. During World War II, the name was changed to the Blue Eagle Café and the business flourished as workers from the busy shipbuilding yards frequented the tavern. In 1949, the name was changed to the White Eagle Café & Saloon, reportedly due to the presence of the white eagle on an early Polish flag. During the 1960s, the White Eagle backslid towards its former more rowdy reputation and was dubbed a “biker bar”. By the end of the decade, the second generation Hryszkos decided to sell the business to another immigrant from New York City, Tony Ferrone. They introduced live music to the establishment as workers from the surrounding industries visited. In 1978, Charles Hughes, a former worker from the Hyster Company, purchased the White Eagle. He soon helped clear the establishment of its rowdy biker reputation and business improved as more workingmen frequented it. His prudent technique was not to discriminate against bikers but refusing the entry of guys who wore their jackets with their own club logos. In 1997, the White Eagle was nominated and later placed on the National Register of Historic Places due to association with ethnic heritage, social history, and entertainment/recreation. In October 1998, it was sold to McMenamins, the local pub chain that enjoyed much success in the 1990s earning a reputation for saving many historic buildings. 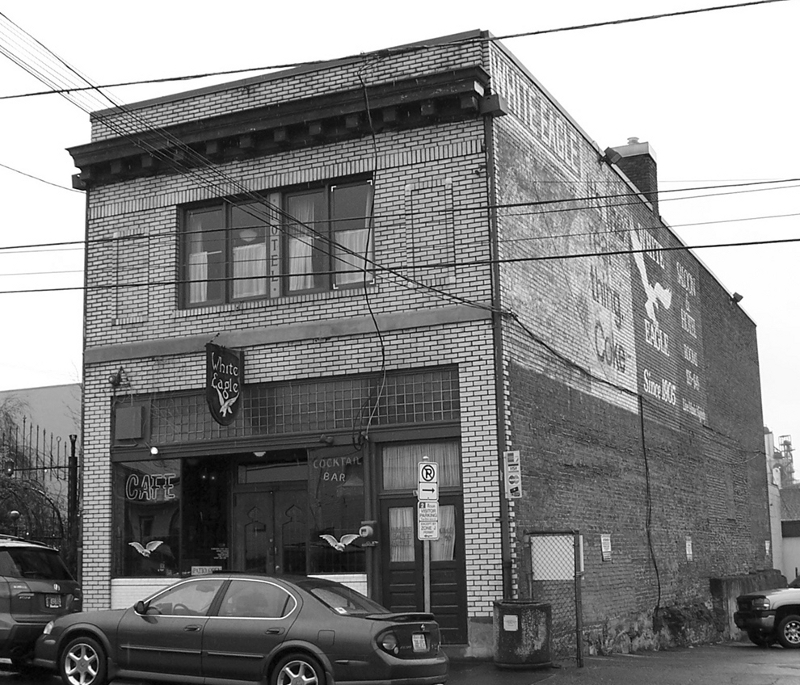 * much information from City of Portland National Register Nomination for White Eagle Saloon, August 1997. An excerpt from the book The History of Albina, available at Broadway Books at 1714 NE Broadway, Rejuvenation Inc. at 1100 SE Grand, and Powells Books at NW 10th & Burnside.